Nearly two years after the release of their sixth album Los Suicidas in November 2015, musical shape-shifters the Meridian Brothers return with their much-anticipated seventh album Donde Estás Maria? on the ‘8th’ of September 2017. It’s the fourth album that the Bogota-based Meridian Brothers have released since signing to Soundway Records in 2012, and although it’s another stylistic departure from the chameleon-like band is the most accessible album of their career. Since the Meridian Brothers released their debut album El Advenimiento Del Castillo Mujer on the La Distritofonica label in 2005, Eblis Alvarez has been determined never to make the he same the same album twice. Instead, the man behind the Meridian Brothers’ throne has continued to reinvent their music over the last twelve years. That was the case when the Meridian Brothers returned with their sophomore album Meridian Brothers VI in 2009. It showcased a much more experimental and playful sound. Eblis Alvarez continued his mission to reinvent the Meridian Brothers’ music when the band released their third album Meridian Brothers VII, in 2011. Meridian Brothers VII found the band fusing Latin, rock and psychedelia. Meridian Brothers VII, and caught the imagination of critics, record buyers and Soundway Records. By then, Eblis Alvarez was one of the leading lights of the Bogota’s thriving music scene. Eblis Alvarez was best known for the three albums he recorded using his Meridian Brothers’ moniker. He was the band’s songwriter-in-chief, played all the instruments, added the vocals and produced the Meridian Brothers’ first three albums. It would be the same when he came to record the fourth album. The only time the Meridian Brothers’ lineup expanded was when they took to the stage. Their genre-melting music was winning over audiences far and wide. Given the quality of the first three albums the Meridian Brothers had released on La Distritofonica, and their growing popularity, it was no surprise when a bigger label came calling. The label that secured the signature of Eblis Alvarez’s Meridian Brothers was Miles Cleret’s Soundway Records. This was something of a coup for Soundway Records, as a number of labels were interested in securing Eblis Alvarez’s signature. With the deal signed, the Meridian Brothers returned with their first new album for Soundway Records in September 2012. This was Desesperanza, which had been inspired by a fusion of disparate and unlikely genres. Somehow, Eblis Alvarez managed to combine electronic and Latin rhythms with psychedelic grooves in such a way that it made perfect sense on Desesperanza. It introduced the Meridian Brothers’ madcap, leftfield sound to a wider audience. This was the perfect way to start what was a new chapter in the Meridian Brothers’ career. This new and exciting chapter in the Meridian Brothers continued as they divided their time between touring and recording their fifth studio album Salvadora Robot. It was released on Soundway Records in July 2014 and again, Eblis Alvarez had reinvented the Meridian Brothers’ music. To do this, he dug deeper into the tropical rhythms of Latin America and the Caribbean on Salvadora Robot. Each song focuses on a different style, and features the Meridian Brothers’ trademark playfulness which is part of the surreal musical landscape. This was a potent and heady brew that found favour with critics and record buyers. As 2014 drew to close, the Meridian Brothers’ music was reaching a much wider audience and they were festival favourites with their unique and inimitable music. Word was spreading about the Meridian Brothers’ music which continued to find favour with music fans. Buoyed by the critical acclaim and commercial success that Salvadora Robot had enjoyed Eblis Alvarez thought’s turned to the next Meridian Brothers’ album. This would be Los Suicadas which marked another stylistic departure from Bogota-based musical shape shifter Eblis Alvarez. Los Suicadas was the first of a trilogy, inspired by legendary Colombian Hammond organist Jaime Llano Gonzalez, a Hammond. He was famous for playing traditional Colombian music including Pasillos, Bambucos, Cumbias, which he combined with foxtrots or waltzes. Eblis Alvarez remembers: “the album was written as an ambient record but at the same time searching for an image of an impossible virtuoso organist.” Joining him on the album were an acoustic rhythm section, electronic drums and samplers that feature on songs inspired by Pasillos, Bambucos, Cumbias and romantic bolero. Just like previous albums Los Suicadas was a suitably eclectic album, ambitious and genre-melting album. It was released in November 2015 to widespread critical acclaim. However, the question was what next for the Meridian Brothers? When the time came for the Meridian Brothers to record their seventh album, musical chameleon Eblis Alvarez had decided to change direction once again on Donde Estás Maria? It would be one of the most eclectic albums of Meridian Brothers’ recording career, and found them drawing inspiration from a variety of musical genres and influences. Before recording began, Eblis Alvarez had written ten new tracks that eventually became Donde Estás Maria? These songs were inspired by a myriad of disparate musical influences from across the globe. This included US-inspired seventies Latin rock, traditional Cumbia music, the Latin American folk music of Argentina and Uruguay, Puerto Rican reggaeton and the electronic sound that has long been a feature of the Meridian Brothers’ music. To this, Eblis Alvarez added the fuzz-filtered guitars of Colombian Latin rock bands like Banda Nueva, and the string arrangements of Brazilian tropicalia acts including Gal Costa and Novos Baianos. Eblis Alvarez also combined Andean rhythms with the lushest of tropicalia influenced strings, and drew inspiration from huayno a traditional music with strong like to the indigenous culture of the Quechua people in Peru and Bolivia. That was combined with the strummed sound of traditional Colombian guitar. Gradually, this delicious musical dish started to take shape as unleashes his trademark fuzzy guitar sound and combines with synths and his newest musical weapon. This was the cello that Eblis Alvarez had started to learn twenty years ago. This was the start of a complicated, almost love-hate relationship with the cello. Eblis Alvarez determined to master the instrument, and over the next few years became a talented player. Despite this, he had never played the cello on a Meridian Brothers’ album. There was a reason for this. Deep down, Eblis Alvarez wasn’t even sure if he like the sound of the instrument? When he plays the Bach suites and baroque music he spends his time searching for, Eblis Alvarez is unsure about his feelings towards the cello? Often he finds the music tired, predictable and easily recognisable. This resulted in what was almost a love-hate relationship with an instrument he had spent twenty years trying to master. Eblis Alvarez was determined to resolve his issues with the cello. He came up with a way to do that prior to recording Donde Estás Maria? Eblis Alvarez decided that he would write and play the cello arrangements on Donde Estás Maria? This was a chance for Eblis Alvarez to resolve his love-hate relationship with the cello. Eblis Alvarez explains: “I have this strange concept that I want to live with things I hate…And usually, that gets you to another level or another result that you never expect.” This appears to be the case with Eblis Alvarez’s cello which plays an important part on Donde Estás Maria? Throughout his musical journey, Eblis Alvarez embraces the various different genres of music that he encounters, including some genres that are part of different country’s musical heritage. This includes huayno, a type of traditional music that is part of the indigenous culture of the Quechua people in Peru and Bolivia. Other times, Eblis Alvarez embraces the contradictions and blurred lines that are part of the continent where he calls home. This ranges from the colonial traditions to music imported to South America. All this has influenced and inspired Eblis Alvarez when he dawned his Meridian Brothers’ moniker to record his genre-melting seventh album Donde Estás Maria? The title-track opens Dónde Estás María, and was chosen as the lead single from the album. That comes as no surprises. 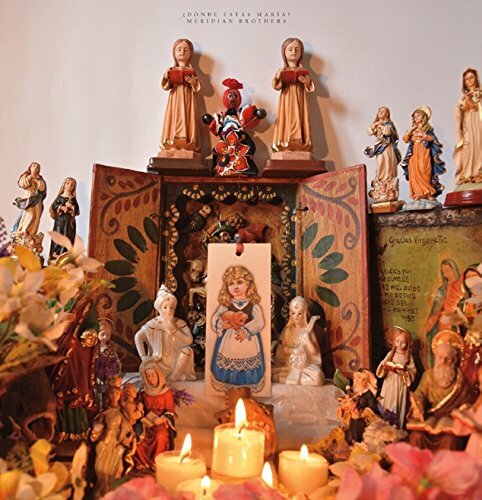 It’s an impassioned and dreamy folk-psych paean, where Eblis Alvarez tenderly sings of his love for an enigmatic and spiritual poetess against a backdrop of subtle cello riffs. This sets the bar high for the rest of Dónde Estás María. Quite different is Canto Me Levantó a carefully crafted ballad which fuses synths, drum machine and cello to create a quite beautiful ballad that references seventies Krafwerk and eighties electronica. Yo Soy Tu Padre, Yo Te Fabriqué is a boogaloo-styled track that tells the strange, surreal and disturbing tale of a record label executive and the Colombian singer he’s helping propel to stardom. The balladry continues on Entra El Ritmo Antillano where Eblis Alvarez’s fuses his trademark fuzzy guitar with rueful and later, urgent strings, cascading synths and a galloping rhythm. They’re part of a dreamy, hypnotic and lysergic backdrop to Eblis Alvarez’s earnest vocal. After this, it’s all change. As Háblame Amigo, Citadino unfolds, it’s soon apparent that this song is something special. Partly, this is down to the irresistible, triumphant reggaeton beat which is joined by a blistering fuzzy guitar and dazzling tropicalia influenced strings. The final piece of the jigsaw is the vocal, where Eblis Alvarez sings call and response vocal on this anthem-in-waiting. Cumbia, Eres La Cumbia is a carefully crafted, genre-melting song that marries a mesmeric cumbia rhythm with a myriad of beeps and squeaks from a bass synth and swathes of sweeping strings. They became one and accompany Eblis Alvarez’s impassioned vocal. Just like on other tracks, Como Estoy En Los Sesenta fuses electronics with traditional Southern American music as Eblis Alvarez delivers another equally impassioned vocal. It’s a potent, powerful and poignant combination. Soon, it’s time for the Meridian Brothers’ to ring the changes. Estaré Alegre, No Estaré Triste is an upbeat track that marries a myriad of electronic and traditional instruments, including Eblis Alvarez’s cello. They combine to create a robotic, hypnotic sound before Eblis Alvarez deploys effects as the arrangement takes on a dubby and then industrial sound. In doing so, this shows another side to the Meridian Brothers’ music on this irresistible and memorable sounding song. Then on Él No Está Muerto the Meridian Brothers combine the unmistakable rhythm of huayno, a traditional music with strong ties to the Quechua people in Peru and Bolivia. It’s fused with the sound of a traditional Colombian guitar and synths. Although this an unlikely mix of the old and new, it works, and works well and creates Latin music for the ‘22nd’ Century. Very different is No Me Traiciones, which has a much more understated and less complex sound than previous songs. It’s a quite beautiful song, with Eblis Alvarez vocal and cello playing their part in the sound and success of the song that closes Donde Estás Maria? It’s nearly two years since the Meridian Brothers released their critically acclaimed sixth album Los Suicidas. It was hailed as the Bogota-based band’s finest hour. That was until the Meridian Brothers released Donde Estás Maria? on Soundway Records on the ‘8th’ of September 2017. Donde Estás Maria? surpasses everything that the musical shape shifters the Meridian Brothers have released so far. Eblis Alvarez takes the listener on a musical journey through the continent he calls home. From Argentina to Mexico, and everywhere in-between Eblis Alvarez draws inspiration not just from each country’s music, but each region’s musical heritage. Like a musical magpie, Eblis Alvarez picks and chooses laments of different genres that became part of the vibrant musical tapestry that is Donde Estás Maria? Other times, Eblis Alvarez draws inspiration from the music of Caribbean, North America and even Europe. All these influences play their part in Donde Estás Maria? It’s an album that marries everything from traditional instruments and the lushest of strings to fuzzy guitars, synths and drum machines. They play their part in album that veers between a complex and experimental sound to an endearing and enchanting simplicity. There’s always been a complexity to the Meridian Brothers’ music from their first few albums. This has been the case since Eblis Alvarez started to embrace evermore complex polyrhythms, time signatures and tempos in much more ambitious ways. While this was something progressive rock musicians have been doing for many years, it was relatively new in Columbia and South American music. Eblis Alvarez was pioneer, which was nothing new. Ever since the early days of the Meridian Brothers, he’s drawn inspiration from a myriad of influences as he released album after album of genre-melting music. This includes Donde Estás Maria?, which is full of inventive and imaginative compositions, where beautiful heartfelt ballads rub shoulders with irresistible and anthemic uptempo tracks on what’s without doubt he Meridian Brothers’ finest hour.